The same day at least 49 people were killed in two separate terror attacks at mosques in New Zealand, a sitting senator in Australia said immigration policies that allowed Muslim people to immigrate to New Zealand were to blame. Sen. Fraser Anning, a member of Australia's right-wing "One Nation" party, released a statement calling Islam a "savage belief" and that Muslims were "not blameless" in the attack. "As always, left-wing politicians and the media will rush to claim that causes of today's shootings lie with gun laws or those who hold nationalist views but this is all cliched nonsense. The real cause of bloodshed on New Zealand streets today is the immigration program which allowed Muslim fanatics to migrate to New Zealand in the first place," Anning's statement said. At least one of the suspects in the terror attacks posted a white nationalist manifesto on Twitter before livestreaming the attack on Al Noor mosque, in which 41 people were killed. "Let us be clear, while Muslims may have been the victims today, they are usually the perpetrators," Anning wrote. Fraser also tweeted a number of Islamophobic messages on Friday in the hours after the attack. 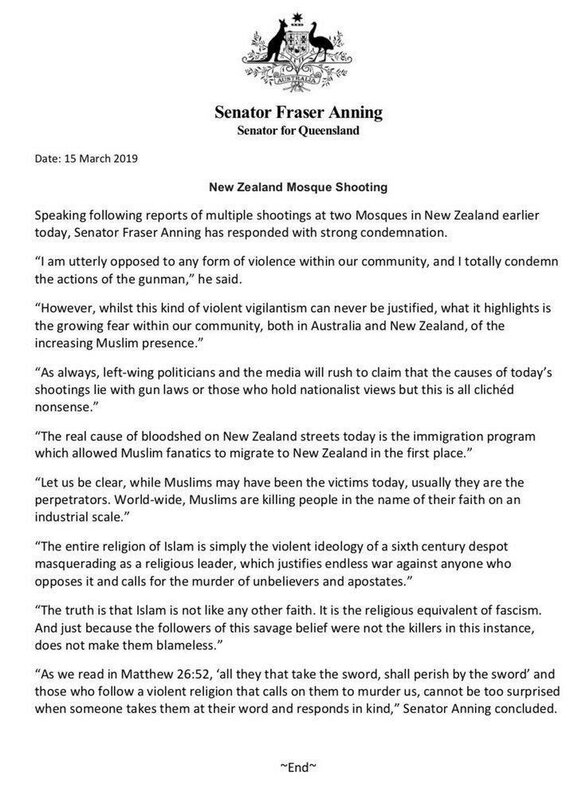 In his statement, Anning did say he was "utterly opposed to any form of violence within out community" and that he "totally" condemned the gunmen's actions. One Australian-born person has been arrested in connection with the shooting. Twitter has confirmed that an account matching the suspect's name has been deleted, and numerous media outlets report that the account had tweeted a white nationalist manifesto in the moments before the attack. Anning has served as a senator since 2017. In 2018, his Facebook was briefly removed for publishing hate speech.